Description: Annual. Bright green leaves offer most delightful fragrance and taste. A prize-winner. Probably the best of the 'bush basils'. 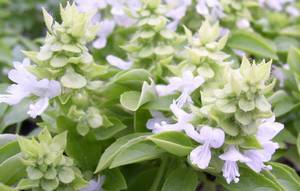 A tidy, compact plant covered with small fragrant leaves. Recommended without reservation for small pot culture. Care: Slower to flower than other basils. Pinch back to delay flowering. Harvesting: Use the leaves of this just as you would any other basil.